The game is fought in two stages. In stage one each player is permitted to place one of his nine pieces at any junction of line segments (corners or center-lines) in succession. An opponents piece may be taken when a player manages to get three pieces on a single line segment (a mill). (A very few versions do not permit this in stage one.) The strategies in this stage are related to, but are more complex than, the strategies for Tic-Tac-Toe (Noughts and Crosses). When all pieces are down, stage two begins (assuming one of the players hasn't wiped out his opponent; unusual but possible). Each player in succession may move one piece along any line segment to the next junction on that segment. Jumping is not normally permitted. The object in this stage is also to form lines of three (mills). The game ends in one of three ways: a tie, by agreement of the players that neither will be able to form further mills; a win, where one player has been reduced to 2 pieces and is thus unable to make further mills; and finally the equivalent of a stalemate in chess, where one of the players is physically unable to move any of his pieces due to the blocking positions of his opponents pieces. The interpretation of this last position varies, but I think the tendancy is to view it as a loss for the player who can't move. Most of the more complex rules involve what constitutes a mill and what pieces if any need to move to make a new mill. An interesting and complex game. There is a 13th century variant that uses dice in stage one. The Dice variant is contained in the Alphonso X ms. 13th c. titled Book of Games. A truly excellent source document. According to OCLC (Thu, 04 May 1995), there is one copy in Cincinnati of Alfonso 's (that's how the library world spells it) Libro de los juegos (OCLC #10920473). It is, however, a photo facsimile with 4 pages to the page; but the illustrations have been hand colored... So it looks like it would be real small; and I think it was an edition from the 1920's or earlier so it may be in pretty fragile condition. I also found references to a microfiche edition from the "Spanish series" of the Hispanic Seminary of Medieval Studies (no. 2, item 13, 3 microfiche) (OCLC#11639281). There's a BIG German treatise (448 p.) on OCLC #4384536 (somebody writing about the book, in German--at this size it probably contains a complete copy of the original item, which would be in the original language). And, probably the most likely, there's a 1987 2-volume set published by the Spanish government, an "edicion facsimile" at OCLC #17601554, with 5 copies in the U.S. I have never seen a variant that did not require the use of two sets of men to differentiate the players. Usually double-sided pieces are used to make it easier to keep track of mills. Many suitable pieces are known from the Viking age but as far as I know none are of certain association with Nine Men's Morris. Diagonals are, in my experience, rare in the nine piece game (the only example I am aware of is a Tudor period version that might have been a twelve piece game). The roman gameboard from Jerusalem could be interpreted this way, but in fact has a random set of lines. Diagonals are much more common in the three piece game. I recall from my reading that the speculation is that mylla and the other northern european names for the game came through German fairly late (c 14th C?). I'm afraid I don't remember the source for the argument, Medieval Scandinavia perhaps? It is named in various languages: Icel. mylla, Pol. mlynek, Germ.(MHG?) Mühle, Fr. jeu de moulin, MFr. mérelles, MEng. merills or morell, Eng. (nine men's) morris. I've seen the name mylta listed somewhere, but have been unable to document it at all. Gameboards in general are called borð or taflborð. The Gokstad game board has some game marked with thirteen squares (fifteen lines?) on the side opposite the Nine Men's Morris game. It falls into that category of games (it is generally assumed) referred to as tafl. This category also includes the famous game board from Ballinderry in Ireland. Despite its place of origin it is usually identified as Scandinavian because of the Borre art elements around the edge. It also has two nobs one in the form of a head. It appears to have used pegs from the holes in the board and the center hole is circled (a double ring) and the corner holes are marked off. It has 7 holes x 7 holes. 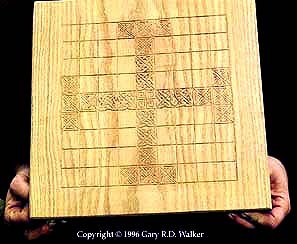 It greatly resembles the game board drawn on the Ockelbo runestone (Sweden) save that that has lines connecting the center to the corner pockets. An oak game board of fifteen squares (only three ranks surviving in the other direction) was found at Coppergate (York). It was 52.2 cm long and had a nailed strip along the edge, a common feature of Viking Age game boards. On the bottom of a oak (quercus) game board (in my opinion originally a trencher/bowl) 70.5 cm long from Toftanes, Eysturøy, Faroes is a grid board of 14 squares (only half of the board still exists but it looks like it might have been 14 x 15 or 14 x 16). The game in the hollow on the upper half looks like nine men's morris at first glance, but closer examination shows no connectors between the three courts, and each corner of each court is set off by an angular stroke like the Ballinderry game. Very odd. The various finds indicate that there used to be a lot more games of this type than are still documented. Most of the boards identified as hnefatafl don't have enough squares (either that or the term has a different meaning in Anglo-Saxon and Old Norse/Icelandic). There's a c 1100-1150 board from Vitenskapsmuseet (originally from the Public Library site) in Trondheim that's identified as hneftafl in From Viking to Crusader, but is clearly Tablut (Tafl) not hnefatafl. It is 25.6 cm wide of unidentified wood with a separate rim. It was marked originally with a 11 x 11 grid (only 2/3 of the board still exists). The center square is marked with an outlined x, then along each center line there are two unmarked squares followed by two squares marked with x's followed by a single unmarked square. VTC indicates that there is a game of Tric-Trac on the back, which is another name for backgammon. Apparently there is currently a trend to identify any board game with squares as hnefatafl. The only close to period example of an actual hnefatafl (another game of the tafl group) board that I am aware of is that from Vimose c 400. It originally probably had a 18 x 18 grid. There is a manuscript drawing of the game from England c 925-40, however, also with an 18 x 18 grid (played on the grid like go, not the squares like chess). The rules are mostly based on that manuscript I believe. The tafl group includes such games as Fox and Geese (the earliest reference to which is supposedly in Grettis Saga of c. 1300 under the name halatafl), Tablut (I learned it under the name King of Sweden), and Cows and Leopards among surviving games and may have included the extinct games Tafl, Hnefatafl and Freystafl. Many others probably existed. I'm told there are slate game-boards known from the Orkneys but I have not yet seen these. Chess is mentioned in written sources as early as 1155 under the name skák or skáktafl. A variant ("no piece, if guarded, can be taken or exchanged") called valdskák was still played in Iceland in the 19th century. I am uncertain how old this variant is. Mate is called mát, in various combinations as well. The combination peðrifr for pawn's mate is also found. The board itself is specifically called skáborð. A form of backgammon under the name kvátra or kvátrutafl is recorded in the 13th century, and may go back further. There is also a goðatafl which appears to be a dice game. Dice-throwing is also called taflkast. Several dice were found at Coppergate (York), especially a 8mm bone die and a 1.1 cm jet die, both cubical. A group of pieces was found in Baldursheimur, in northern Iceland from the 10th century. The group included a bone die, hollow and rectangular. The Viking grave find at Ile de Groix included a 2.8 cm long rectangular die made of marine-mammal tusk (probably walrus). Just as an aside, at least one pair of existing Viking Age dice are known to be loaded. A number of names for game pieces are recorded: hnefi, the king in hnefatafl; tafla (plural: töflur), the other pieces in hnefatafl; húnn, a conical piece in a pin game, possibly also a conical piece in hnefatafl; and tanntafl, walrus tusk pieces. One antler game piece was found with the double sided board from Gokstad. A number of pieces in various materials are known from Lund (Sweden). This includes walrus ivory (at least one figurine holding a beard (a god?) and a turned piece), a wood "king", a piece in rock crystal, and a number of pieces in amber and bone. Many pieces were found at York (Coppergate). Some crude pottery. Some finer antler or stone. One set of chalk pieces in white and red (pigmented) was found. In Gunnarshaug, Norway a group of glass cones interpreted as game pieces was found. There were at least 3 types: 11 light blue, in two sizes; one darker blue with a brown tip apparently pierced; and a set of 4 cones yellow with brown tips. They are believed to date from c. 800. A group of pieces was found in Baldursheimur, in northern Iceland frm the 10th century. The group included 24 turned pieces identified as walrus ivory, a 3.9 cm high figure usually interpreted as a god and probably used as a king in a tafl type game such as hnefatafl or tablut, and a bone die described above. Two fine lathe-turned sort of conical walrus ivory game pieces, 2.2 cm and 3 cm in height, were found at Sandnaes (Kilaarsarfik), Ameralla, Ruin group 64V2-iii-511(V51), Greenland. They are dated to the 11th century. The Viking grave find at Ile de Groix included 12 gaming pieces of antler and marine-mammal tusk (probably walrus). They look mostly like oblate spheroids. There's a c 1100-1150 pear-shaped (sort of) piece in walrus ivory found with the board from Vitenskapsmuseet (originally from the Public Library site) in Trondheim. It has a flat base, broken top, a hole in the base, and a polished upper surface. There are two carved walrus ivory disks dated to the twelfth century from Vordingborg, S. Sjaelland, Denmark. The first believed to be native has a bearded man holding two dragons each by their neck (5.6 cm dia.). The second is probably not native but variously attributed and has a monster with 3 bearded heads with Phrygian caps and an acanthus terminating coiled tail. There is additional acanthus vine and the border is carved with palmettes. The History of Chess site has this picture of a scandinavian knight of the 9th-10th C. There are also several other scandinavian chess pieces on the Early European Chess Pieces page. 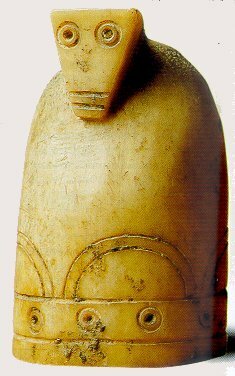 A fragment of a probably Norwegian walrus ivory chess piece (a knight) was found in a Lund (Sweden) bone and antler workshop from the 12th century. The greatest find of scandinavian game pieces comes from the Isle of Lewis in the Outer Hebrides, Scotland dated to the third quarter of the 12th century. Some think they are of Norwegian origin. The find includes 14 walrus ivory disks 5.2 cm in diameter each finely inscribed with a compassed circle around the edge (they may have been carving blanks). The prize of the find, however, is the 78 (there may have been more originally) walrus ivory chessmen (the remains of four nearly complete sets: 8 kings, 8 queens, 16 bishops, 15 knights, 12 rooks, 19 pawns - no two pieces exactly the same I am told; 1 knight, 4 rooks and 45 pawns short of being 4 complete chess sets) in scandinavian romanesque style. One of the true treasures of the Middle Ages. A chess piece similiar in style to the Lewis chessmen was found in Trondheim. The Old Norse names of the chess pieces appear to be: in general, skákmaðr; konungr/kóngr, the king; dróttning, the queen; biskup, the bishop; riddari or riddarakappi, the knight; hrókr or hróksvald, the rook or castle; and peð/peðsvald (apparently from French), pawn. The term bóndi may also refer to the pawn. See the games section of the medieval bibliography. Also any general archaeological survey such as Viking to Crusader or The World of the Vikings CD-ROM . You can also try King's Table: A Scandinavian Board Game. I haven't actually read this yet, but it might be useful. Also Games of the Viking and Anglo-Saxon Age (updated 2/22/02). Look especially at Hnefatafl - the strategic board game of the Vikings (updated 30/12/06), an excellent piece of work. Return to Norse, Norse FAQ, Medieval Cultural Background, or Ravensgard. Last updated 4/19/01. Copyrights © 1996, 1997, 1998, 2000, 2001, 2007 Gary R.D. Walker. All rights reserved.